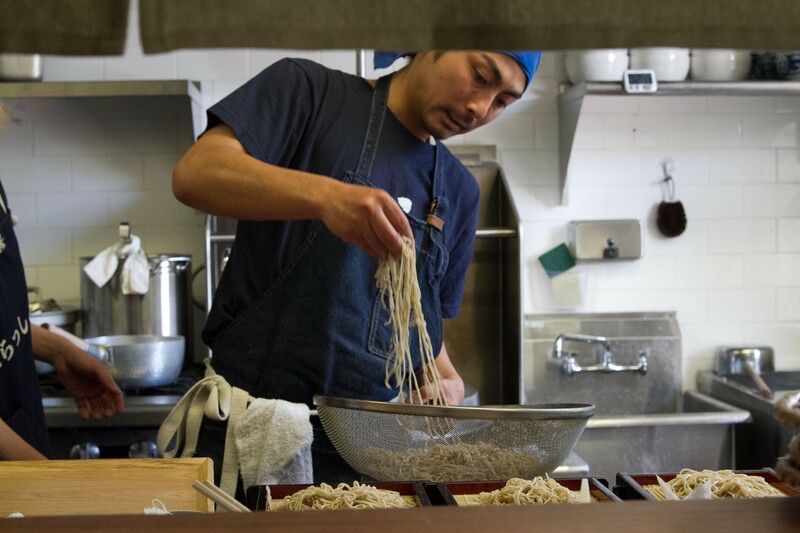 Soba Ichi specializes in handmade buckwheat noodles. With all the attention given to ramen and udon, it might be easy to overlook soba, the thin, spaghetti-like Japanese buckwheat noodles that can be served both hot or cold. West Oakland’s new restaurant Soba Ichi (2311 Magnolia St.) aims to give soba a boost to diners unfamiliar with the dish. The restaurant had its grand opening last week, and occupies the space formerly held by Korean-fusion restaurant FuseBox. But aside from geography, Soba Ichi shares little with its predecessor. “Soba” is Japanese for buckwheat, and the restaurant prepares its soba noodles by mixing a ratio of about 80 percent buckwheat flour to 20 percent wheat. 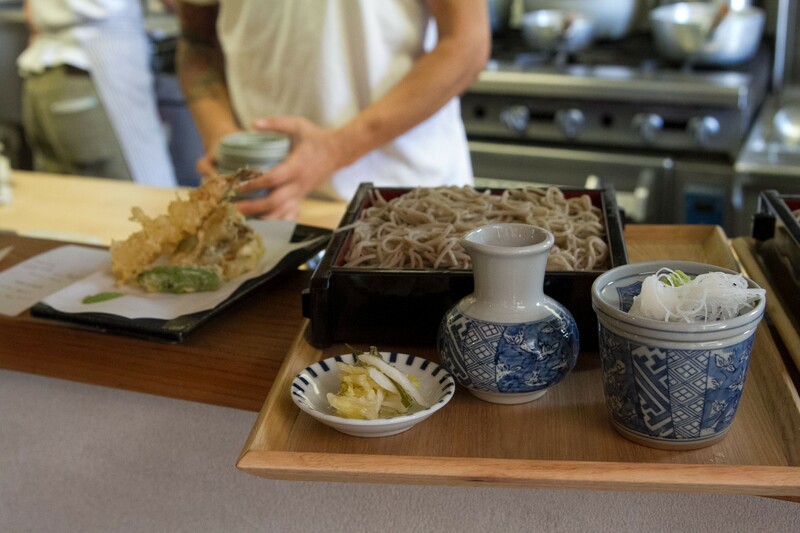 (Soba Ichi also makes some gluten-free, 100-percent buckwheat noodles.) Water is then added and the mix is kneaded, pressed flat, sliced thinly, and boiled for only a few moments before it is either set aside to cool and serve with a side of dipping sauce, or else mixed with a splash of broth for those who like it hot. Dishes range in price from $14 seiro, a standard 150-gram serving of soba with broth or sauce, to $22 tenseiro, a regular-size portion of seiro served with assorted tempura. Diners can also order small plates such as nukazuke (seasonal pickled vegetables), vegetable kakiage (mixed vegetable tempura), and nishin misoni (miso-simmered herring), all in the range of $5 to $12. Though the street-facing terrace, with its shaded patio tables and burbling fish pond, is not branded specifically as a “beer garden,” it might be hard for patrons to resist the allure of a pint. On draft, Soba offers an IPA from Berkeley’s Hoi Polloi, as well as a pilsner from West Oakland newcomer Ghost Town Brewing. There are also sakes and shochus on the menu, the majority of which are imported from Japan. Soba Ichi is a joint venture of owner Shinichi Washino and chef Koichi Ishii, in partnership with Christian Geideman and Paul Discoe, the owners of Berkeley’s much-lauded izakaya, Ippuku. Washino and Ishii had previously worked as cooks at Ippuku, where the quartet first connected. Discoe also designed the minimalist space, which is dominated by pale wood. The hot and cold menu selection makes Soba Ichi suitable for both balmy Bay Area days and foggy Bay Area nights. But for now, Soba Ichi is only open lunchtime hours, from 11 a.m. until the noodles run out, Tuesday through Saturday.